(CNN) -- The first guests checked back into the Taj Mahal Palace and the Oberoi-Trident hotels Sunday, marking the reopening of the two luxury venues damaged by terrorist attacks in Mumbai last month. 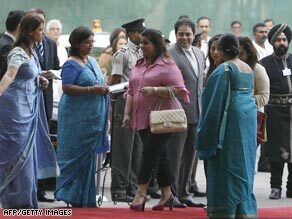 Guests arrive Sunday at the Taj Mahal Palace hotel in Mumbai. Along with new guests, the hotels' five restaurants were booked with diners, representatives of the Taj Mahal said. "Today has been an incredibly moving day. The Taj has been reopened, after a massive concerted effort, in dedication to all of those who lost their lives in the attacks on Mumbai," said Ratan Tata, the chairman of the company that owns the the Taj Mahal Palace hotel. "All the 550 guest rooms, including the executive floors, of the hotel are ready to receive guests," a hotel spokesman said, adding the business was reopening with "heightened security,"
There were still portions of both hotels that could not reopened because of damage, including the Heritage wing of the Taj Mahal and the Oberoi wing of the Oberoi-Trident. The scene Sunday is a far cry from November 26 when the hotel and many other locations in Mumbai were paralyzed by a mass of coordinated attacks. Terrorists using bombs, gunfire and fire caused the deaths of more than 160 people over three days of sieges throughout the city that is India's commercial capital. They took hostages at the Taj Mahal Palace and Tower and Oberoi-Trident hotels. The assaults also targeted a historic train station, a Jewish cultural center and other landmarks.